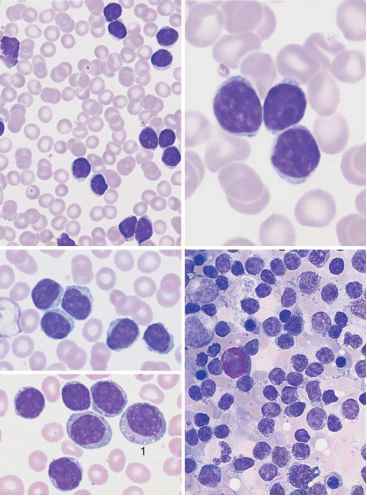 Microspherocytosis This corpuscular form of hemolysis is characterized by dominant genetic transmission, splenomegaly, and a long uneventful course with occasional hemolytic crises. Blood analysis shows erythrocytes which appear strikingly small in comparison with leukocytes. The central light area is absent or only faintly visible, since they are spherical in cross-section rather than barbell-shaped. The abnormal size distribution can be measured in two dimensions and plotted using Price-Jones charts. Close observation of the morphology in the smear (Fig. 50) is particularly important, because automated blood analyzers will determine a normal cell volume. The extremely reduced osmotic resistance of the erythrocytes (in the NaCl dilution series) is diagnostic. 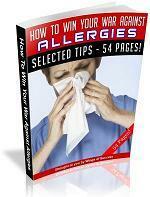 Coombs test is negative. Stomatocytosis is an extremely rare hereditary condition. Stomatocytes are red cells with a median streak of pallor, giving the cells a "fish mouth" appearance. A few stomatocytes may be found in hepatic disease. Hemoglobinopathies (see also thalassemia, p. 138). Target cells are frequently present (Fig.47). 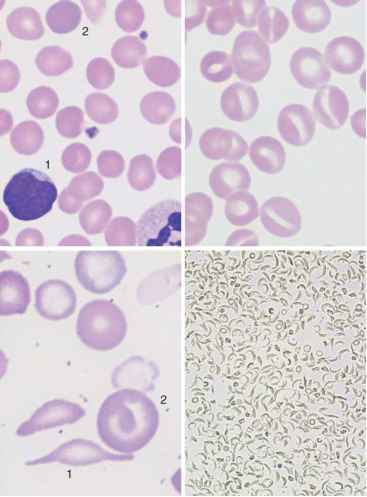 In addition to target cells, smears from patients with sickle cell anemia may show a few sickle-shaped erythrocytes, but more usually these only appear under conditions of oxygen deprivation (Fig. 50). (This can be achieved by covering a fresh blood droplet with a cover glass; a droplet of 2% Na2S2O4 may be added). Sickle cell anemia is a dominant autosomal recessive hemoglobinopathy and is diagnosed by demonstrating the HbS band in Hb-electrophoresis. Homozygous patients with sickle cell anemia always suffer from chronic normocytic hemolysis. If provoked by oxygen deficiency or infections, severe crises may occur with clogging of the mi-crovasculature by aggregates of malformed erythrocytes. Patients who are heterozygous for sickle cell anemia have the sickle cell trait but do not display the disease or its symptoms. These can, however, be triggered by very low oxygen tension. Sickle cell anemia is quite often combined with other hemoglobinopathies, such as thalassemia. Schistocytosis (Fragmentocytosis) If, in acquired hemolytic anemia, some of the erythrocytes are fragmented and have various irregular shapes (eggshell, helmet, triangle, or crescent; Fig.49), this may be an indication of changes in the capillary system (microangiopathy), or else of disseminated intravascular coagulopathy (DIC). Microangiopathic hemolytic anemias develop in the course of thrombotic thrombocytopenic purpura (TTP, Moschcowitz disease) and its related syndromes: in children (hemolytic uremic syndrome, HUS); in pregnant women (HELLP syndrome); or in patients with bone marrow metastases from solid tumors. Fig. 50 Microspherocytes and sickle cells. All erythrocytes are strikingly small in comparison with lymphocytes (1) and lack a lighter center: these are microspherocytes (diameter < 6 ^m). Polychromatic erythrocyte (2). b Erythrocytes with an elongated rather than round lighter center: these are stomatocytes, which are rarely the cause of anemia. c Native sickle cells (1) are found only in homozygous sickle cell anemia, otherwise only target cells (2) are present. d Sickle cell test under reduced oxygen tension: almost all erythrocytes appear as sickle cells in the homozygous case presented here.